January 4th, 2018: United Products has announced the completion of its first project with Wright Steel Construction, at the Mountbatten family home, Broadlands Estate, near Romsey. The building, a cold rolled portal frame with a single skin, will be used by the Romsey Show Committee, to store their show equipment. 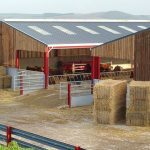 United Products (UP), part of the CA Group of companies, specialises in delivering made to measure buildings to the agricultural, commercial and industrial sectors. UP designs, manufactures and delivers a wide range of steel products including profiled sheets, gutters, flashings, rainwater goods, sections, purlins and rails as well as bespoke fabrications. All building components are CE marked, comply with British Standards and meet ISO 9001-2008 requirements.